TURIN -- Fiat S.p.A. will keep its core auto operations within its holding company and split its truck and tractor divisions into a new public company to be called Fiat Industrial S.p.A.
Fiat announced today its namesake brand -- along with Alfa Romeo, Lancia, Ferrari and Maserati -- and its light commercial vehicle division will remain part Fiat S.p.A.'s 111-year-old holding company. Also, the portion of Fiat Powertrain Technologies that makes engines and transmissions for Fiat vehicles will remain within Fiat S.p.A. to complement the automotive operations. Fiat CEO Sergio Marchionne said the spinoff should be completed by the end of the year. Reports on Tuesday had said that Fiat would spin off its autos business to allow Marchionne an entity to facilitate future alliances and launch a share sale to generate cash to expand, a move advocated and expected by financial analysts. But Marchionne's announcement today that he will go in the opposite direction will give markets an easy, clean way to re-rate Fiat's non-automotive business as an independent listed company. Fiat S.p.A. also owns the Fiat trademark, so keeping autos and instead spinning off the group's Iveco trucks and Case New Holland tractor units will keep the trademark where it is actually used. Keeping the autos unit within the holding company may also help a possible, stronger capital integration between Fiat autos and Chrysler Group. Fiat plans to boost its current 20 percent stake in Chrysler to 35 percent within two years. 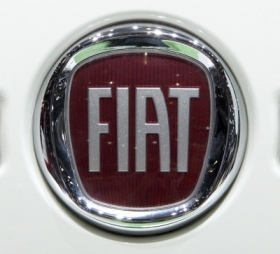 Fiat's auto business accounted for 52.5 percent of last year's group revenues of 50.1 billion euros ($68.7 billion) and 44.4 percent of its trading profits.